In mid to late December I closed out 4 positions. The fact was I owned too many companies and (1) couldn't follow them as closely as I'd like and (2) many positions were too small to "care" about. I had a few more potential positions to cut for either tax loss harvesting, performance or position sizing and decided to sell about 40% of one of my holdings right before the 2018 closed. I initiated a position in General Electric in July 2013 and picked up 2 more chunks throughout 2014. 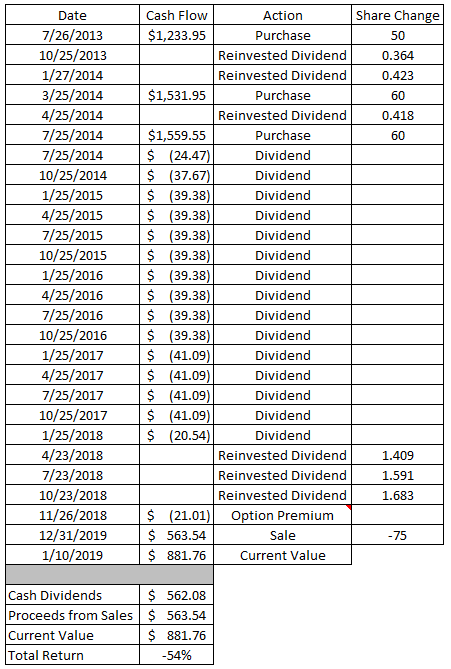 I took most of the dividends in cash; however, I did start reinvesting the dividend in early 2018. My total position in General Electric had grown to 175.888 shares, 170 of which I had purchased. On December 31st I sold 75 shares for $7.58 per share. Excluding cash dividends received on those shares I took a 70% loss on the shares. Ouch! But at least I got $1,322.56 of losses to use against my gains for 2018. Silver linings! The fact of the matter is that I stuck with General Electric much too long. In December 2017 management cut the dividend payment in half and I should have sold then. However, I failed to do so because the damage is usually done prior to the dividend being cut. The goal of the dividend cut was to reduce cash outlays in order to shore up the balance sheet. Well, as 2018 moved along the share price kept drifting lower and lower and by December 2018 the dividend was cut again this time from $0.12 down to $0.01. 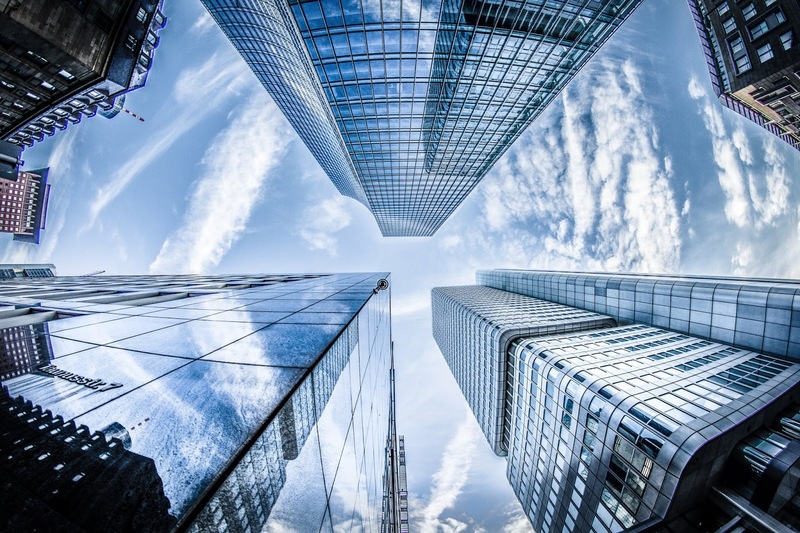 This was done once again to reduce cash outlays and help shore up the balance sheet. That has to be 2 of the worst Christmas presents I've ever received! After sitting on some very ugly losses I figured it was time to cut some of my losses. I didn't want to completely close the position just yet because I expect there to be a a rebound as General Electric hopefully navigates this rough patch. Time will tell if they are successful or not. So I reduced my position from 175.888 shares down to 100.888 shares. The plan is to try and use options as a way to reduce my basis over time but it's going to be a really long go of it. The proceeds from this sale didn't amount to much at just $563.54 so this was very much a sale about tax loss harvesting and just reducing my exposure to an investment that realistically have a multi-year turnaround effort ahead of them. This didn't have much effect on my forward 12-month dividends as that damage had already been done with the 2 dividend cuts/reductions. After selling the 75 shares my forward 12-month dividends were reduced by $3.00. Meh. Always tough cutting your losses, but better to make the decision and move on - sounds like a good clean up to start the new year. Hopefully any new investments in 2019 don't let you down! Yeah this one stung a bit and I should have cut my losses a long time ago. I'm glad to have cleaned up the portfolio a bit, raise some cash, and start looking for other more promising opportunities. If you don't believe GE will turn the ship around, then by all means sell and move on. Two dividend cuts in a short timespan is tough to swallow :-( Good luck with deploying your capital elsewhere! I think that puts them at 3 cuts in the last 10-11 years. The cut during 08/09 was understandable; however, the way management went about it was very poor. I have the same feeling about how this cash crunch was handled by management too. When they made the 50% dividend cut at the end of 2017 management talked about how this was going to be enough and that it would allow them to get things corrected. Obviously that didn't happen. In hindsight I'd have preferred that they made a deep cut and reduced the dividend altogether in late 2017 or reduced it to the token $0.01 payment to conserve as much cash as possible, but that's not what they decided to do and instead strung investors along. However, there's no one to blame but myself. The last 100 shares I'm going to be aggressive with selling call options against them and won't defend the position at all to try and make back a little bit of the lost capital and also hold on to shares in hopes of a turnaround. But I won't be devoting any time/energy to GE other than that. It's pretty epic indeed to see such an iconic company go through this. I should have trusted myself rather than trusting management in this situation, but gave them the benefit of the doubt. Luckily GE has been the only really big loser in terms of capital and the rest have more than picked up the slack for them.